December 29 is the New Year’s Eve on Tibetan Calendar traditionally. On that day, all the Tibetan people will eat a traditional food, Thukpa Bhathuk. It is a hand-rolled noodle with broth. Normally, some religious activities is accompanied with the eating, such as burn hay, set off firecracker and religious chanting. Local people think these activities can make the evil spirit out of their house and then they can embrace the New Year. 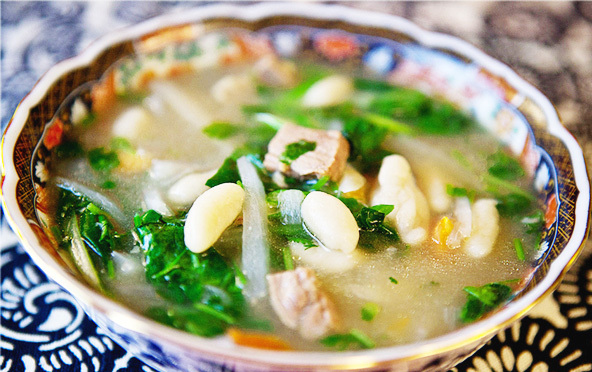 The tasty Thukpa Bhathuk is made of garlic, beef bouillon, beef meat, onion, spinach, tomato, cilantro and daikon. The making process is pretty simple, that people firstly make the dough rope and then pinch off dough and press its stuffing to the pinched dough. Cook will also put some symbolic things into the soup, such as stone (meaning heartless), chill (meaning speak harshly) and harcoal (meaning vicious), etc. After serving the Thukpa Bhathuk on the table, family members will gather and eat together. When someone eats the ‘special ingredients’, he or she need instantly spit it out. Later, the family will laugh together and the entire room will have the festival atmosphere. For more tradition in Tibet New Year, or travel information, you can contact our local Tibet travel agency.